This may be one of the most controversial whiskies to hit the market in some time, and a bit of explanation is in order. Diageo’s Crown Royal Distillery in Gimli, Manitoba makes more than 50 different styles of whiskies that are blended to make the various Crown Royal expressions, including what has always been referred to internally as a “Bourbon Mash.” It’s made using a Bourbon-style mashbill, unlike many of the other styles that are distilled from separate grains and blended together later, and is normally used as one of the flavoring whiskies in a Crown Royal blend. Of course, “Bourbon” can only be made in the U.S. under U.S laws and international treaties, including the North American Free Trade Act. Diageo received a TTB label approval for this expression from the U.S. government, but after receiving complaints about the use of the word “Bourbon,” retracted that approval while allowing Diageo and retailers to sell bottles that had already reached the market (including the bottle shown in this photograph). 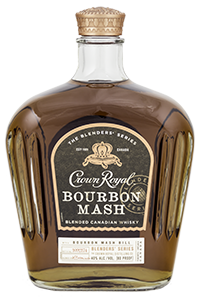 The whisky has been renamed and returned to the market as Crown Royal “Blenders’ Mash” while keeping its original name in Canada. As for the whisky itself, the nose is creamy with vanilla, muted spices, honey, and a soft oakiness. The taste starts off light with vanilla cream and honey notes, then soft allspice and black pepper come alive while not overpowering the lighter notes underneath. The finish is medium-length with spices that linger nicely.